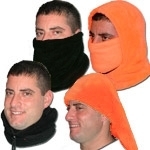 AC 900 - Hood Hat Fleece Balaclava with Drawstring & Cordlock (Shown as Neck Warmer) This close-fitting Fleece includes covering for the head and neck, leaves only the face, or parts of it exposed. Intended for use in chilly to sub-zero temps. Excellent for winter usage on the Job, Hunting, Ice fishing, Hiking or under a motorcycle helmet! One size Fits Most. Hooded Deer Camo Print Micro Fleece Jacket with Side Pockets and Front Zipper. Ladies Cut Sizes Small - 3X-Large. Hooded Flying Eagles Print Micro Fleece Jacket with Side Pockets and Front Zipper. Ladies Cut Sizes Small - 3X-Large.